This is the site for the Spring 2016 HUM473: Festivals digital humanities course sponsored by the Council of Public Liberal Arts Colleges (COPLAC) and co-taught by Dr. Catherine Kroll, Professor of English, Sonoma State University in Rohnert Park, California and Dr. Whitney Snow, Professor of History, Midwestern State University in Wichita Falls, Texas. 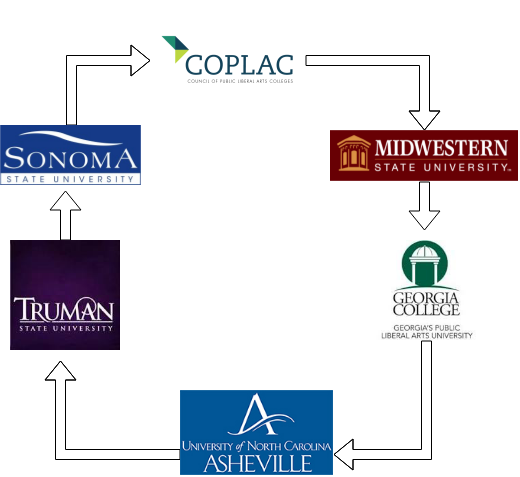 Students in this course hail from COPLAC colleges and universities all around the United States. Facilitating the twice weekly web conferencing meetings on Tuesday and Thursday afternoons are Greg Dillingham and Cliff Hedrick of the University of North Carolina, Asheville. Students’ central goal in the course is to research a local festival of their choice through a variety of methodologies–oral history, ethnography, and library and archival research–and to build a website showcasing this research. Supporting this project are readings in digital humanities scholarship, ethnography, anthropology, and history. Students also blog weekly about the progress of their research, comment on one another’s projects, and reflect on the readings. Image source: Petrillo Music Shell at the 2008 Chicago Blues Festival; Flickr user D. L.CC Attribution-Share Alike 2.0, Wikimedia Commons, 2008.